A healthy appetizer or light entree perfect for a warm weather lunch or dinner. Lightly steam cabbage leaves and then set aside. Cook shrimp with spices and mince together with onion. 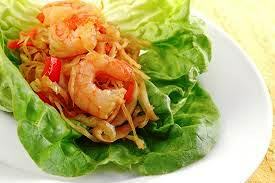 Wrap up shrimp mixture in cabbage or lettuce leaves and enjoy with dipping sauce. Another alternative is to place multiple rolls in small baking dish. Cover with vegetable broth and bake for 25 minutes at 350 degrees. Variations: Dip wraps in Sweet wasabi dipping sauce or top with additional Bragg’s.